Here's my card for the CFC76 CAS-ual Fridays challenge to get your "kraft on." I used a Simon Says Stamp star border die (that I won!) to make the blue and kraft panels. I trimmed the kraft panel down to one row, and added red, white, and blue stars for some contrast. The red dsp is from BoBunny, and the navy layer has no stars inserted in the star shapes, that's the white card stock showing through. 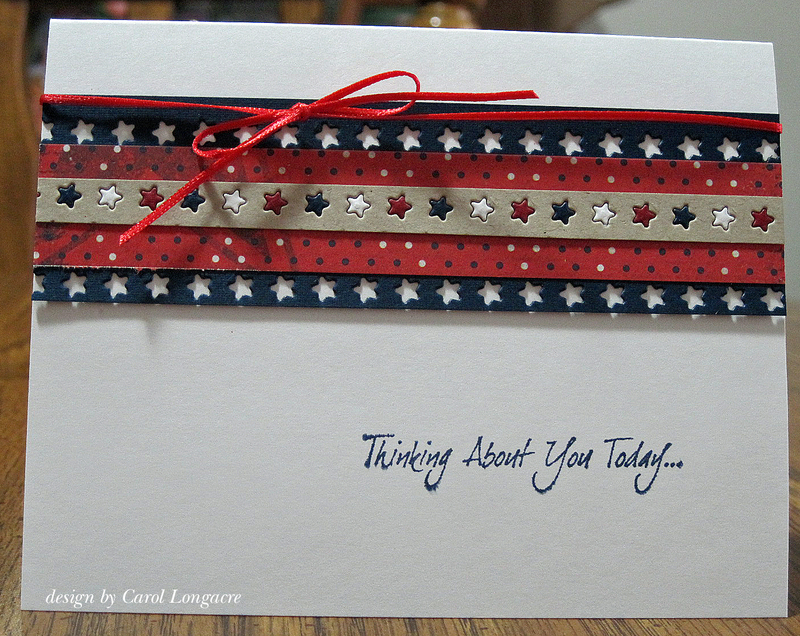 The sentiment is by Unity and was stamped with night of navy ink, and the narrow ribbon is from my stash. This will be my last post until hurricane Sandy has left the east coast. I'll be shutting my computer down as the storm worsens throughout the day, and it appears likely that we'll lose power along with millions of other folks in Sandy's path. I'll catch up with commenting and visiting your blogs as soon as I'm able to get back on line! Take care everyone, and stay safe!!! That is a super red, white, and blue card, Carol. Pretty stars! Stay safe and I'll be watching for your return. Hope you won't be without power for too long. Thanks for finishing up with a mighty fine card! I just knew you would love that star border! Great win! Love it, Carol! LOVE that star border!!! WOW! Perfect card! Hang in there on all this weather that's coming! 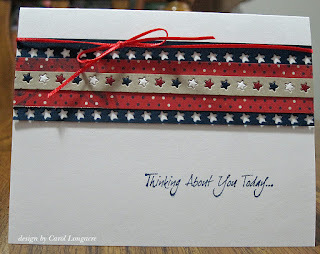 I love this layout and the red,kraft and blue! It's going to make a soldier very happy! I hope you've stayed safe and sound during the hurricane. I'll be waiting to see you around blogland and know you are OK.
Great punch work! It must have taken ages to alternate all those tiny stars. Hope the hurricane doesn't do much damage--you will be in my thoughts! Hope you are keeping safe, warm and dry my friend. Keeping you in my thoughts and prayers that you and yours stays safe through-out Hurricane Sandy. Oh my gosh, you must have some patience to fit all those different colored stars into the diecut! Love this! Thanks for joining us at CAS-ual Fridays! !